A journalism academic at City University London has warned that the UK’s Freedom of Information (FOI) Act and the work of investigative journalists is under threat by the Government’s consultation on FOI reform. Tom Felle, who has co-edited a new book on FOI in neighbouring jurisdiction Ireland, said that changes made by the Irish government to its transparency regime were likely to be copied wholescale by the UK government. The Justice Secretary Michael Gove MP announced in June that he planned to “revisit” the 2000 legislation, telling the House of Commons the Government had a “duty of care” to respect confidentiality of civil servants’ advice to ministers. A cross-party Commission is currently reviewing the act and is expected to report by the end of the year. 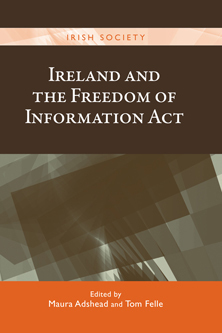 In 2003 the Irish government changed its legislation, claiming FOI was too intrusive and burdensome. Public interest tests were replaced with blanket bans. “Access to documents used by the government in making cabinet decisions, no matter how anodyne, were automatically exempted," added Tom. "Time limits on the release of cabinet documents were extended, and most controversially fees were introduced for requests and appeals. The result was that use of the Act plummeted and investigative journalists found it impossible to do their job. Tom Felle is a Lecturer at the Department of Journalism at City University London and the co-editor of Ireland and the Freedom of Information Act (with Dr Maura Adshead, University of Limerick, Ireland) and published by Manchester University Press. The academic explored the threats to the UK's FOI legislation in more detail in an article for Press Gazette, warning: "The Irish know how costly a closed FOI regime can be. Don’t let the same mistakes happen in the UK." Tom has co-edited another book on the subject, FOI ten years on: freedom fighting or lazy journalism?, which was published in January 2015 to coincide with the tenth anniversary of the UK Freedom of Information Act.